Earn up to 1,245 reward points. The M81 is the latest installment in TELEFUNKEN Elektroakustik's dynamic microphone range. 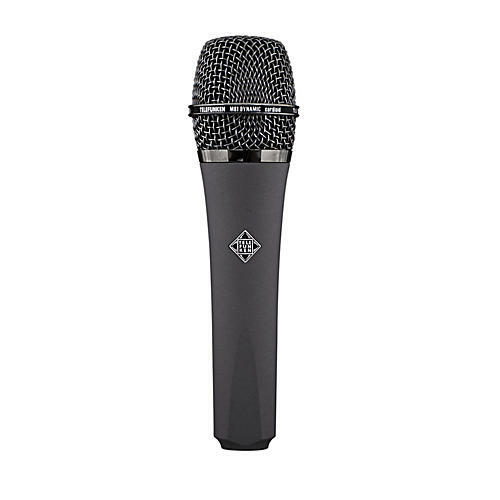 Designed with the goal to develop a microphone that would not only complement the M80, TELEFUNKEN Elektroakustik's first dynamic offering, but to also stand out in a universe filled with dynamic microphone options. When the M80 was first introduced in 2008, it quickly became a favorite in both live and studio environments. Its clear and detailed top end, articulate mid-range, and minimal proximity effect won the hearts (and ears) of thousands of new users, making it a staple for vocal and snare drum applications, as well as the most popular microphone in the TELEFUNKEN product line. Building on many of the strengths of the M80, the TELEFUNKEN M81 retains the same minimal proximity effect, superior feedback rejection, and articulate mid-range. However, with the M81, the top end is pulled back a bit, yielding a flatter overall frequency response. This combination results in a microphone with a wealth of body and clarity, making it a great tool for taming brighter vocals and guitar tones and for fattening up percussion, horns and thinner sounding sources. The TELEFUNKEN M81's tailored frequency response makes the microphone exceptional on electric guitars, percussion, rack and floor toms, and brass instruments. This microphone's wide range of uses and rugged reliability make it the workhorse for the new generation. Finished in the same flint gray body tube and tri-chrome head grill styling as the R-F-T AR-51, the M81 is readily identifiable when reaching for the microphone. The M81 was very much designed with the AR-51 in mind. Great care was taken to tune the M81's overall response to be complimentary to the AR-51 when recording electric guitars. Elevate your performance with one of the finest dynamic microphones on the market.